Angels infielder Albert Pujols (right) celebrated with teammate Erick Aybar after Pujols’ game-winning home run in the 19th inning. ANAHEIM, Calif. — From an emotional standpoint, Red Sox manager John Farrell said it felt like two losses. Given the circumstances, he actually underestimated by a little. Albert Pujols led off the bottom of the 19th inning with a home run as the Los Angeles Angels beat the Red Sox, 5-4, early Sunday morning. Pujols connected off Brandon Workman to decide a game that ended at 3:39 a.m. on the East Coast. It was the longest game for the Red Sox since a 20-inning loss against the White Sox in 2006. It also was the longest game in the majors this season. “I couldn’t be more happy and proud of the way we continued to battle all the way through 19 innings,” Farrell said. 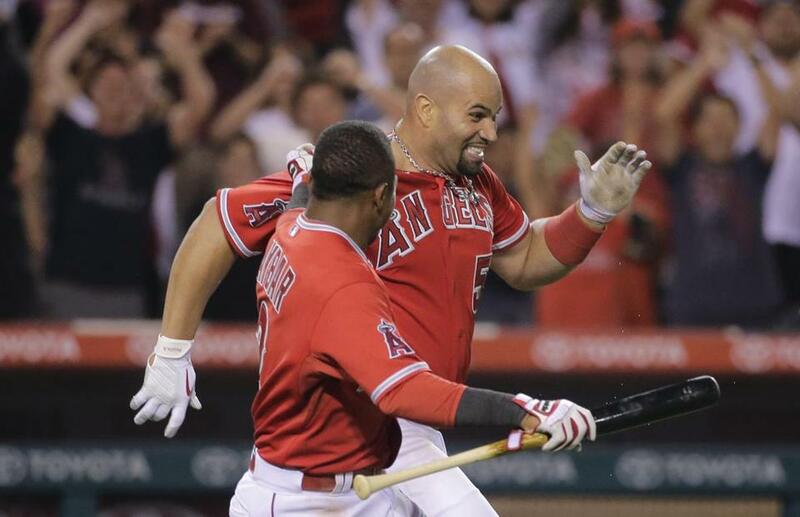 Pujols slid into the plate when he scored, surrounded by celebrating teammates. The Red Sox then asked for a video review of the home run, which just cleared the wall in right center. After a brief delay, the call was confirmed. Workman, who had pitched Thursday, fell to 1-6. Pujols was the first batter he faced after eight other Red Sox pitchers had gone 18 innings and thrown 266 pitches. Rookie Heath Hembree went four shutout innings and threw 62 pitches in his Red Sox debut. The righthander, obtained from the San Francisco Giants in the Jake Peavy trade last month, had never pitched that long in a professional game since being drafted in 2010. Hembree entered the game in the 15th inning and allowed only two hits. Josh Hamilton doubled with one out in the 17th inning and the Red Sox issued two intentional walks before Hembree escaped. “He was outstanding,” Farrell said. Hembree was optioned back to Triple A Pawtucket after the game so the Red Sox could get a fresh arm for their bullpen for Sunday afternoon’s game. The Red Sox have lost five of seven. The Angels snapped a four-game losing streak. The Red Sox took a 4-3 lead in the top of the 14th inning in a most creative way. Dustin Pedroia singled with one out against Cory Rasmus. With David Ortiz up, the Angels shifted their infield to the right side, leaving only shortstop Erick Aybar on the left side of second base. Pedroia stole second and when Aybar looked away, he got up and kept on going to third base as the Angels forgot to cover the bag. It counted as two stolen bases. Ortiz then lofted a sacrifice fly to left field for his second RBI of the game. Junichi Tazawa, who Farrell intended to rest, then emerged from the bullpen and the lead evaporated quickly. Pinch hitter Chris Iannetta doubled to right field. Another pinch hitter, Efren Navarro, walked. Kole Calhoun singled to load the bases. Mike Trout, whose home run in the eighth inning had tied the game, was next. He grounded to shortstop and Xander Bogaerts flipped to second instead of going to the plate. Pedroia didn’t try to complete the double play and threw to the plate, but Iannetta was safe. Albert Pujols grounded out and Josh Hamilton struck out. Pedroia said he didn’t think he had a shot at Trout and went to the plate. He told Bogaerts to be ready and got the feed in front of the bag. “I’d rather try and win and get that if we could,” Pedroia said. Tazawa retired Pujols on a grounder to third and struck out Hamilton to end the inning. The Red Sox had only six hits in the game — three over the last 12 innings. The Sox took a 3-2 lead into the eighth inning and stuck with Clay Buchholz, who had thrown 106 pitches to that point. He got one out before Trout homered to right center field. Still, it was a solid outing for Buchholz. He allowed three runs on six hits over eight innings and struck out eight with two walks. The righthander had given up 18 earned runs over 16 innings in his previous three starts. The Red Sox did not have a hit over the first six innings against Garrett Richards, a righthander who has emerged as the Angels’ best starter after two years of pitching primarily out of the bullpen. That changed in the seventh inning as Richards quickly lost a 2-0 lead. Pedroia led off with a single up the middle, smacking a fastball right past the pitcher. Ortiz was next and he doubled to left center, deep enough for Pedroia to score. Yoenis Cespedes singled to left field and Ortiz stopped at third base. Then the Angels got sloppy. Mike Napoli grounded to shortstop and Erick Aybar had a play at the plate. But he dropped the ball and Ortiz scored without a play. Daniel Nava was next and he grounded to second base. Howie Kendrick booted what could have been a double play ball and the bases were loaded. Bogaerts, down 1-2 in the count, sent a sacrifice fly to center field to give the Red Sox the lead. Bogaerts had a sacrifice fly in the ninth inning against the Cardinals on Wednesday night that gave the Red Sox a 2-1 victory. Richards, who threw 104 pitches, left the game at that point. The Red Sox had a chance to add to their lead but Will Middlebrooks struck out looking and Christian Vazquez flied out to deep center field. The Angels led 2-0 three batters into the game. But it was not entirely Buchholz’s fault. Calhoun led off with a double to center. The ball landed beyond the range of Brock Holt, who was starting in center field for the sixth time in his career. Trout followed with a single to left field. After a wild pitch moved the runners up, Pujols hit a sinking liner to center field that Holt could not come up with on a dive. Two runs scored on the double. The balls hit by Calhoun and Pujols would have been routine plays for Jackie Bradley Jr. had he been in center field. But he was out of the lineup for the fourth time in the last five games. Bradley entered the game in the eighth inning and made two highlight catches in center field, one in the ninth inning and another in the 15th. Bradley also was 0 for 4 at the plate and is now hitless in his last 31 at-bats. Buchholz shut down the Angels after the first-inning double by Pujols, retiring 11 consecutive batters. He did not give up another hit until the sixth inning when Trout singled. But Buchholz retired the side from there. Kendrick reached on an infield hit to start the seventh inning. But Buchholz was tough again, getting the next three hitters. Vazquez made a nice play on the third out, springing out from behind the plate to field a tapper off the bat of Colin Cowgill. The rookie snapped a powerful throw to first to get the runner by a step to end the inning and earned a tap on the helmet from Buchholz. Vazquez caught the entire game, an incredible 272 pitches.